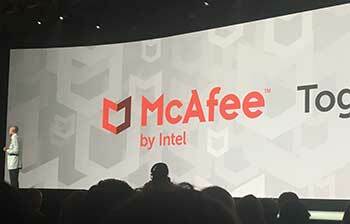 With the dawn of the new name and new products, McAfee by Intel has a new look. The new look on the right; will be the face of McAfee by Intel as portrayed at the company’s Focus 16 event in Las Vegas on Tuesday. Our new logo is a “visual representation of the future” for Intel Security, Senior Vice President and General Manager (and soon-to-be McAfee CEO) Chris Young said. Chris Young stated that it is a symbol for them for their new beginning to an approximate of 3,500 customers and partners in the audience. He also stated that it is a visual representation of what is important to their DNA and their strategy. He further went on to quote that the logo design dates back to the legacy roots of McAfee a name that was before its 2010 acquisition by Intel for 7.6 Billion. The Logo: Red in the logo design recognizes McAfee’s past with the shield shape projecting defense and the two connection making a shield depicting togetherness with the rest of the industry stated Young. This identity honestly hits me with the HTML 5 logo, nevertheless, the customized font has a new appeal and the overall need to revamp the identity is perhaps far from a desperate cry to display their existence. Next Post: Election Day Verdict – The Yes, the No, and the Why Should We?